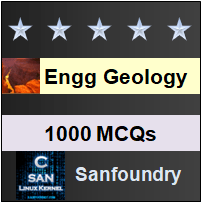 This set of Engineering Geology Multiple Choice Questions & Answers (MCQs) focuses on “Recognition of Faulting”. 1. What is the criteria for a covered surface to be said a fault? Explanation: An exposed or covered surface may be suspected of being a faulted surface if it polished, and carries grooves and striations. 2. What is the reason for abrupt termination? Explanation: A group of beds or some veins or dykes may abruptly terminate along a surface in a given region. This may generally be due to breaking of the strata into blocks and movement of the disrupted blocks away from each other. 3. What is indicative of faulting? Explanation: When in the field the same layer or rock is encountered more than once in a certain section, that is, it is repeated in space, faulting is indicated. Similarly, omission of certain of beds in some directions as proved by thorough study of stratigraphy of the region, is also indicative of faulting. Explanation: Disruption of the beds due to faulting generally results in their displacement, which may be determined in terms of slip, separation, offset and gap etc. 5. What kind of evidence the physiographic features provide? Explanation: Some physiographic features may serve as indirect evidence of faults. Among them, the most important are: aligned springs and offset streams. Explanation: Any rock on or below the crust may withstand all the operating stresses up to a limit, which depends upon its cohesive strength and internal friction. 8. When are the normal stresses formed? Explanation: In highly oversimplified situation, the type of fault likely to form is related to stress field operating in a given area. Thus, talking in terms of the three principal stresses, normal faults would form when, the maximum stress is vertical. 9. What is the assumed nature of the rock for the study? Explanation: In all the idealized situations, it is assumed that the rocks are isotropic in character and the Mohr-Coulomb Law of rock failure holds good in those cases. 10. What is the cause for compressive force? Explanation: Gravity or normal faults are believed to be causes under the influence of horizontal tension whereas thrust faults are the result of compressive forces that may throw the rocks into severe type of folding before actual development of faults. 11. A fracture is formed perpendicular to the axis plane of a fold. State true or false. Explanation: A fracture is formed parallel to the axis plane of a fold where the shearing strength of the beds is overcome by the shearing stresses responsible for the development of the fold.